Billy: What’s your favorite color? Ellen: Flesh, like the Crayola color. Billy: Didn’t the NEA [National Endowment for the Arts] cut off funding for that color? Excerpt from an exchange between two characters on ABC’s thirtysomething episode broadcast in New York on 22 January 1991 (Dubin 1992: 316–7). ‘Race. Flesh’. 1999. Colors. December 1998–January 1999: 38. Dubin, Steven C. 1992. Arresting Images: Impolitic Art and Uncivil Actions. New York: Routledge Press. Roth, Lorna. October 2011. 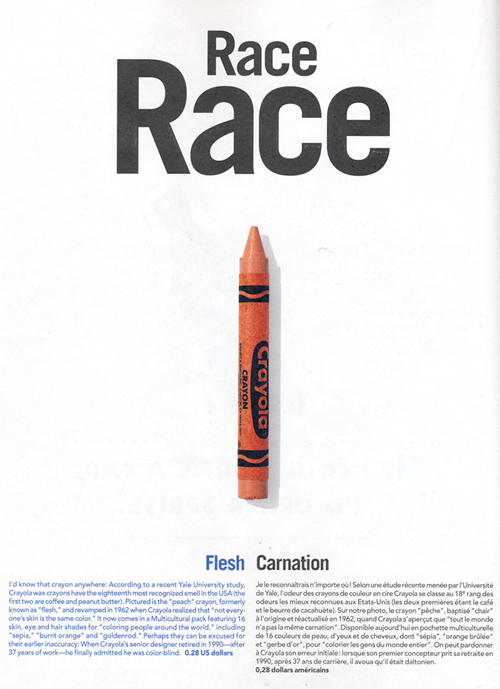 “Flesh in Wax: Demystifying the Skin Colors of the Common Crayon.” Jonathan Finn, Ed. In Visual Communications Reader. Oxford University Press. Roth, Lorna. April 9, 2009. “Home on the Range: Kids, Visual Culture, and Cognitive Equity,” in Cultural Studies /Critical Methodologies, Special Issue on Race and Kids Culture.